My CHASE placement entailed working for two months as a Project Coordinator for the Institute of Contemporary Arts’ Luis Buñuel retrospective. This terrific opportunity to be behind the scenes of an institution that promotes an understanding of radical art and culture brought me into close contact with a broad spectrum of activities. The ICA – as I came to know at first hand – is a pioneering exhibition space, and presents a diverse and exciting programme of talks, screenings, workshops and events. My proximity to this wide-ranging programme, whether in terms of its overlap with the Buñuel retrospective, accompanying staff tours of a new exhibition, or exchanges with my new colleagues in the curatorial office, made this placement a truly immersive experience. The retrospective itself, which looked back upon the life and work of Spanish surrealist filmmaker Luis Buñuel, involved a month of screenings and discussion panels with academics, critics and screenwriters. My main focus was to curate and subsequently chair a panel discussion (https://www.ica.org.uk/whats-on/luis-Buñuel-discreet-charm-bourgeoisie) on the subject of terrorist violence in the cinema of Buñuel. In setting up this forum, I was able to combine my own research interests with the film season’s stated aims to open up new critical perspectives on Buñuel, surrealism and documentary film. After shortlisting potential panelists and following consultation with educational partnerships curator Astrid Korporaal and cinema manager Nico Marzano, who acted as my line managers, I coordinated invitations and event briefing. With invaluable support from both ICA and CHASE, I managed arrangements and budgeting for travel, accommodation and fees on behalf of the speakers – one of whom flew over from Los Angeles to take part in this event. A real highlight of this placement was the opportunity to chair a discussion highly pertinent to my research with leading academics before a packed auditorium. In addition to organizing this panel, I worked with the ICA’s communication team to publicise the season via social media. Research skills again came into play to compile material for a Twitter campaign. Excitingly, I participated in a takeover of the ICA’s Instagram feed and shared a series of original Buñuel film posters from the 1970s, complete with semiotic analysis. 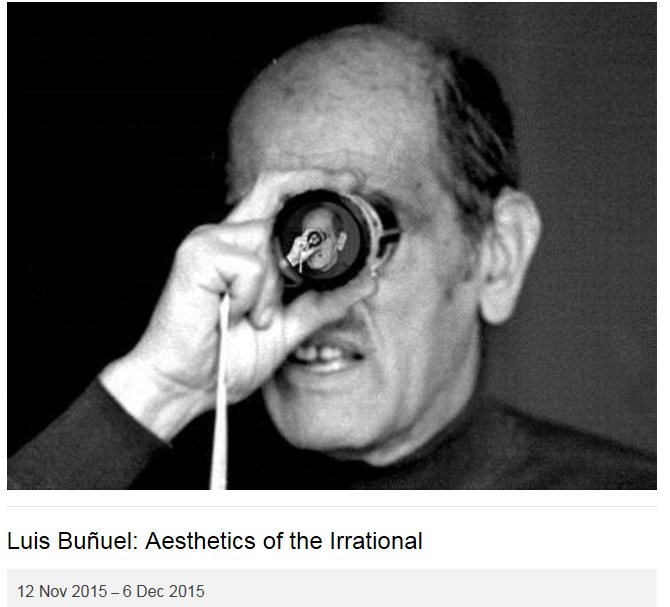 I hugely enjoyed writing a short essay (https://www.ica.org.uk/blog/bunuel-and-cinematics-terror) for the ICA blog on the subject of terrorist violence in Buñuel, once again drawing from my own research and tailoring this material for a non-specialist audience. Outside of social media, I was involved in publicising the retrospective through various channels including mailing lists, UK-based Buñuel specialists and academic departments, making the most of CHASE connections to HE institutions. In a demonstration of the collaborative nature of this placement, this CHASE connection also alerted me to a CHASE academic specializing in material digital culture, who was subsequently invited to introduce one of the screenings. More unexpectedly, I learnt much more about the logistics of curating a film season, which were entirely new to me. Alongside the ICA cinema team, I helped to locate and obtain screening rights for some of the rarer films – this was a retrospective that prided itself on screening from original prints wherever possible, and 80 per cent of the screenings were shown on 35mm. Beyond the Buñuel season, I was enlisted to put together educational resource packs for different – though often interrelated - ICA projects, such as Radical Disco, an exhibition on Italian architecture and nightlife in the late 1960s and early ’70s. In doing this, I gained insight into the implementation of an effective outreach program, and the presentation of radical art to a younger audience. In sum, this placement granted me a unique opportunity to develop skills across a broad spectrum, from working collaboratively in a team to event management and contemporary curation. Throughout, I spoke to or corresponded with fascinating people, from film directors to prominent critics to well-known actors to the ICA curators themselves, and felt fully immersed in the rich and varied programme of art, talks, music and film at the ICA. Working with relative independence within a supportive environment enabled me both to make connections within the art world, and gave me a sharper sense of the lie of the academic landscape beyond. This placement was the first project to emerge from the collaborative partnership between CHASE and the ICA (https://www.ica.org.uk/learning/research-collaborations), and, based on my own enriching experience, I can only hope that there will be many more.